Playa Flamingo by the beach and with use of communal pools. 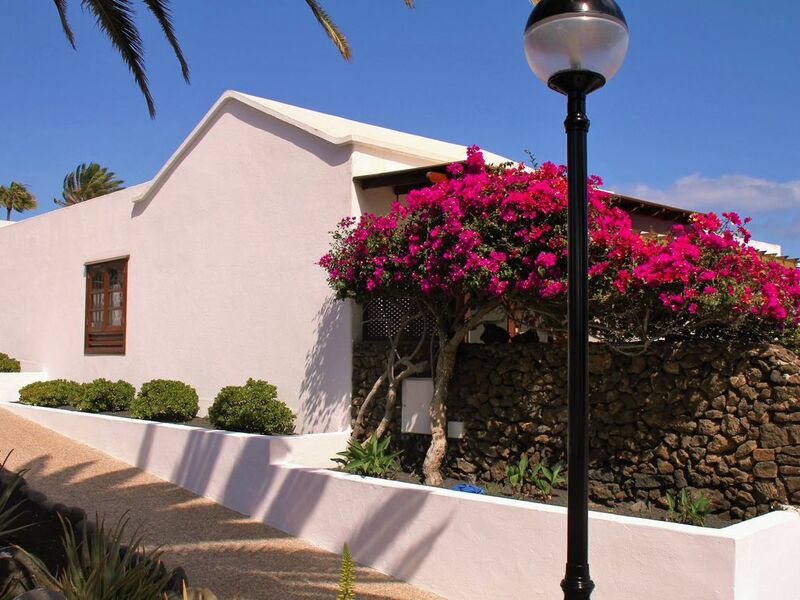 Our apartment is situated on a beautiful complex just outside the village of Playa Blanca. It's a one bedroom apartment in a great location overlooking a sandy beach. The apartment is on the ground floor and is accessed by steps leading to a private terrace with sea views. The complex has recently been refurbished to a high standard with well maintained gardens, pool bars and well stocked supermarkets. There are restaurants both on the complex or in the village which is just a ten minute stroll away. The accommodation comprises a terrace with sunbeds and a table, chairs and parasol. Through patio doors there is an open plan living area with a sofa and chairs, TV and book cases. The kitchen and bar areas are equipped with everything you should need for your stay. The bedroom has twin singles that can be arranged to your liking and there is a wardrobe and a safety deposit box. The bathroom has been recently refurbished and is fully equipped with a walk in shower and a washing machine. The apartment is comfortably furnished throughout and is in a fantastic location on this really well appointed and hugely popular complex. It's a great place to base yourself for exploring the island or just relaxing in the sunshine. I grew up in the village of Burnham in the south east of England. I'm a keen traveller and sun lover and have been enjoying the Canary Islands with my family since the 1980's. The apartment was a joint purchase with my sister way back in 1985 and is now shared by our two families. The apartment is jointly owned between my family and my late sister's family. We've had the apartment from new. The site was just being developed when we saw it first. We looked all over Lanzarote and then came back to this place as it was a really special location. Playa Blanca is a lovely village that's changed a lot since 1985 but hasn't lost any of it's warmth or charm. The apartment benefits from a great location for the beach or the pool. It's on a really nice complex with beautiful gardens and lots of facilities. One of the best beaches in the village is only 100 meters away and the closest pool is less than 50 meters from the terrace. The complex is quiet and relaxing offering an ideal base for either exploring the island or just soaking up the sun. Bathroom with walk in shower, toilet, basin and washing machine. The beds will be made up before you arrive. Bath towels are provided, please bring your own beach towels. On site Gym and indoor pool. Sofa and 3 arm chairs. A TV which receives local channels, some are in English. DVD player and a radio. Book cases with a selection of novels in English. Feel free to swap with ones you've read. Under the counter fridge with an ice box. Small free standing oven and a microwave. Fully equipped with all you should need. Microwave, small oven, 2 ring ceramic hob, fridge, toaster and kettle. Pots and pans and utensils for a self catering holiday are supplied. Table and 2 chairs inside or you can eat at the bar. We usually eat on the terrace where there is a table and 4 chairs. Selection of books in English. Feel free to swap with ones you've read. With 2 sun loungers, umbrella, table and chairs. The complex has 4 outside pools and one indoor. A delightful apartment on a wonderful complex. Quiet and private, but close to the village, the harbour and most of all the beach. The apartment is in a fantastic location, being about 100 yards from the beautiful Flamingo beach. We had fantastic weather throughout our stay and we particularly enjoyed watching the beautiful sunsets while enjoying a glass of whine on the patio area. We thoroughly enjoyed our stay in this bungalow, which is spacious and very private on the large terrace. The view over the sea and beach from the terrace specially watching the sunsets. It was less than a minutes walk to go for a swim in the bay. The bungalow was in a quiet location on this complex, and well located for supermarket and walks. It is about 10 mins walk to the harbour and most of restaurants etc. The bungalow is well equipped to self cater, with lots of crockery etc. We would be very happy to stay here again. Pleasant, well-equipped apartment in quiet location. Convenient to beach and all amenities. Spent a week in October 2018 in this pleasant apartment. The complex appears to be almost in 2 parts - traditional apartments to one side which belong to Tui Family Life and bungalow style accommodation which is type I stayed in. Apt is located on the beach and has sea view. It is quiet and apt was fully equipped with everything required for a holiday, even down to beach chairs and brolly. The walk in shower was most welcome as I have problems with accessing baths. Very close by are a selection of restaurants and supermarkets. The town centre is about 10 mins walk. Here you will also find the bus statiin where you can travel to/fron airport for €3.30. Would recommend. Wonderful holiday! Would have loved to have stayed longer. Excellent location, beach is great and many good restaurants within 2 minutes walk. Accommodation very good but air conditioning would have been a bonus. The fan in the bedroom was very noisy and unfortunately did not seem to cool us down at night hence only given just the four stars. However this did not spoil our holiday in any way and would definitely recommend this property and would certainly stay here again. Communication with the owner was excellent! We are so glad you enjoyed your stay, and it was great to able to communicate with you so easily. This is a lovely apartment, equipped with everything you could think of. The location is perfect, the sea and nearest beach is a stone throw away and a lovely walk to the town via the promenade with a few bars/restaurants along the way. The complex itself is lovely and clean with the use of 5 pools, though it is located on an all inclusive complex and were not able to buy drinks or food from the bar. Though that did not bother us, it may others. I would recommend staying here, we had a lovely holiday. We are really glad that you enjoyed your stay, and thank you for your nice review. The island airport is Arrecife which is approximately ½ hour from Playa Blanca. Hoppa buses are easy to arrange on the internet to cheaply provide for transfers to and from the apartment and the airport. In addition taxis are available from the airport. They cost around 50 Euros. Lanzarote is the most easterly of the Canary Islands being approximately 30 miles by 11 miles in size, and is situated just 70 miles from the African coast. The dry, sunny climate can be virtually relied on throughout the winter as well as the summer. Average rainfall is only 4 inches a year. Many activites are available on the island such as surfing, windsurfing, snorkelling, scuba diving, fishing, tennis and golf. There are miles of golden sandy beaches and many places of interest to visit. There are excellent restaurants in Playa Blanca offering a wide selection of cuisine. It is approximately 15 mins walk to the village along the sea front on a recently built promenade. Buses are available from Playa Blanca to Arrecife and Puerto del Carmen, and many tours can be booked if required from the main reception. Ferries run from Playa Blanca harbour to Fuerteventura and there are also several boat trips available from this harbour. Booking Notes: Bookings are taken for periods from 1 to 6 weeks. A non-refundable deposit of £50 per person will be required for bookings up to 3 weeks, and £75 for bookings of over 3 weeks. The rental price includes electricity, water, bed linen and towels (please bring your own beach towels). The apartments will be cleaned and prepared each Thursday with clean towels supplied on the Monday each week. Changeover Day: Thursday to Thursday but in special circumstances bookings may be taken on alternative days. Apartment has to be vacated by 10.00 am on the day of departure, and may not be occupied until 2.00 pm on the day of arrival. Notes on prices: Prices for the property per week are in UK pounds.